SAN FRANCISCO (Reuters) - Microsoft Corp is to give away its Windows operating system to makers of smartphones and small tablets for consumers as it seeks to make more of an impact on those fast-growing markets and counter the massive success of Google Inc's free Android platform. Microsoft's move, announced at its annual developers conference in San Francisco, is an attempt to broaden the small user base of mobile versions of Windows, in the hope that more customers will end up using Microsoft's money-making, cloud-based services such as Skype and Office. Up to now, Microsoft has charged phone and tablet makers between $5 and $15 per device to use its Windows system, as it has done successfully at higher prices for many years with Windows on personal computers. Hardware makers factor the cost of that into the sale price of each device. That model has been obliterated in the past few years by the fast adoption of Google's Android system for phones and tablets, which hardware makers quickly embraced and now accounts for more than 75 percent of all smartphones sold last year. Apple Inc's iPhone and iPad account for most of the rest of the mobile computing market. By contrast, Windows-powered phones held only 3 percent of the global smartphone market last year. Windows tablets have only about 2 percent of the tablet market, according to tech research firm Gartner. Microsoft's move to make Windows free for some consumer devices bucks a central tenet of Bill Gates' original philosophy, that software should be paid for, which led to Microsoft's massive financial success over the last four decades. But analysts said it is a realistic reaction to the runaway success of free Android. "Microsoft is facing challenges on the mobile and tablet fronts and need to change their strategy to move the growth needle, this is a good and logical first step," said Daniel Ives, an analyst at FBR Capital Markets. Windows will be free for companies making phones and tablets with screen sizes under nine inches for the consumer market. A license fee will still apply for business devices. It comes a week after new Microsoft Chief Executive Satya Nadella unveiled new versions of Word, PowerPoint and Excel applications for Apple Inc's iPad. A year's free subscription to Microsoft's cloud-based Office 365 service will be offered on the new devices running the free Windows, Microsoft said. Both moves show that Microsoft is now more interested in gaining market share for its cloud-based services such as Office on any platform or device, rather than its traditional approach of putting Windows at the center of everything it does and extending its influence from there. 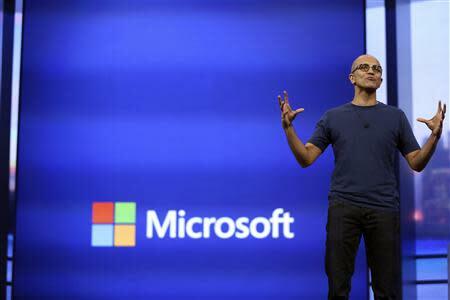 In the new era of mobile computing, Nadella acknowledged Microsoft's underdog status. "We are going to innovate with a challenger mindset," said Nadella in a question and answer session at the developer conference. "We are not coming at this as some incumbent trying to do the next version of Windows, we are going to come at this by innovating in every dimension." Nadella did not have a snappy answer to the question of what Microsoft's overarching mission now was, after it had achieved its original goal of putting a computer on every desk and in every home. Instead he elaborated on remarks he made last week about the importance of mobile devices as everything we do becomes digitized and connected to the internet. "Our vision, simply put, is to thrive in this world of mobile first, cloud first," said Nadella. "Our goal is to really build platforms, create the best end-user experiences, the best developer opportunities and IT infrastructure for this ubiquitous computing world." Also at the gathering, Microsoft formally announced it has developed a voice activated phone assistant feature called Cortana, a direct rival to Apple's Siri. 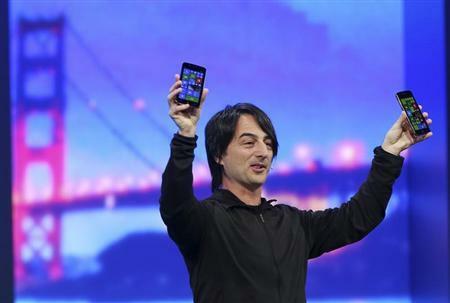 The feature has been rumored for some months and a test version was demonstrated at the event by Joe Belfiore, a Windows Phone executive. The Cortana service, which can take verbal instructions to search the Web, set alarms, make calls and a host of other actions, is still in beta testing but will soon be a standard feature on Windows phones, said Belfiore. He announced that the latest version of Microsoft's smartphone software, called Windows Phone 8.1, will be rolled out to consumers as a downloadable upgrade in the next few months, and new phones running the software will be in stores by late April or early May.